A typical Pineapple block is really only made up of squares within squares. Let me show you how I draw them with this "square" idea in mind. This block will have 1.00" strips and a 2 1/2" center. Block Size: 12.50" x 12.50"
1. Begin by drawing two lines to divide the block into quarters. Select both lines, right-click and convert to guides. These will serve as our guides to the center of the block, since our graph paper is set to odd numbers. 2. 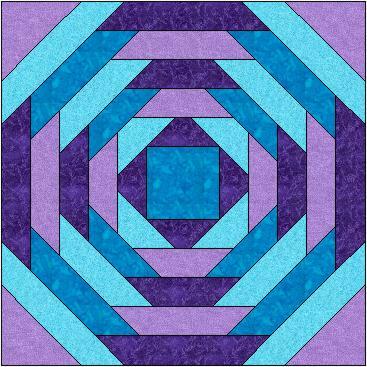 Draw a 2 1/2" square in the center of the block. Note: Each graph paper grid = 1/2". 4. Draw the on point squares. Begin in the center 2 1/2 grid spaces above the center square. You won't see a grid dot there but there is one! End the line on the right center the same distance from the center square. Your line should be 45 degrees and pass right over the corner of the center square. Draw the rest of the square. 5. Draw the remaining on point squares, beginning each 3 grid spaces from the previous one. To draw the corner triangles, count 3 spaces between each one. Again keep in mind that all these diagonal lines are 45 degrees. You should see the formation of perfect 45 degree diamonds as you draw the last diagonal lines. Now for the fun part. ;-) You need to delete all the unwanted lines. You may need to zoom in to get those small ones. (Tip: Hold down the Delete click as you click to make quick work of deleting!) In the following illustration I've already deleted the excess lines in the top center and right diagonal of the pineapple rows.